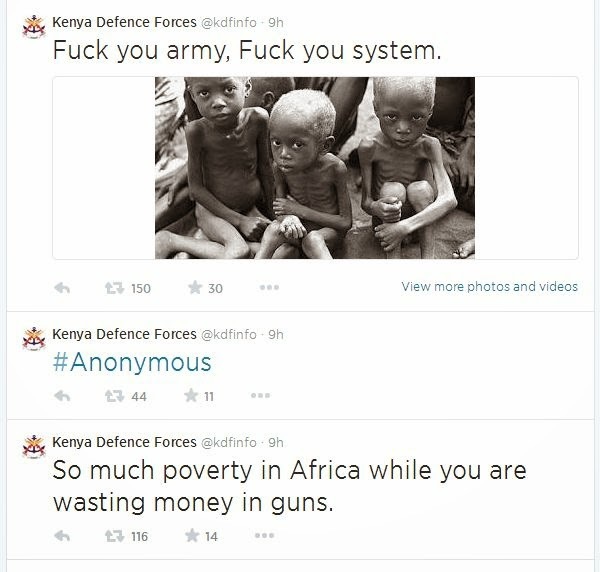 A notorious cyber criminal network, has hacked a verified Kenya Defense Force(KDF) twitter account. The network assumed administrative post of the account Sunday night and is still in controlling it. KDF spokesperson Major Emmanuel Chirchir’s twitter account has also been hacked by the same network. ChirChir uses his Twitter to post updates about battles and Kenya’s intentions in Somalia. ” Military working closely with the police in tracing #Anonymous group which hacked @kdfinfo and @MajorEChirchir ,” Capital Fm Kenya reported.